I haven't posted a wishlist in forever so I thought I would share one today. 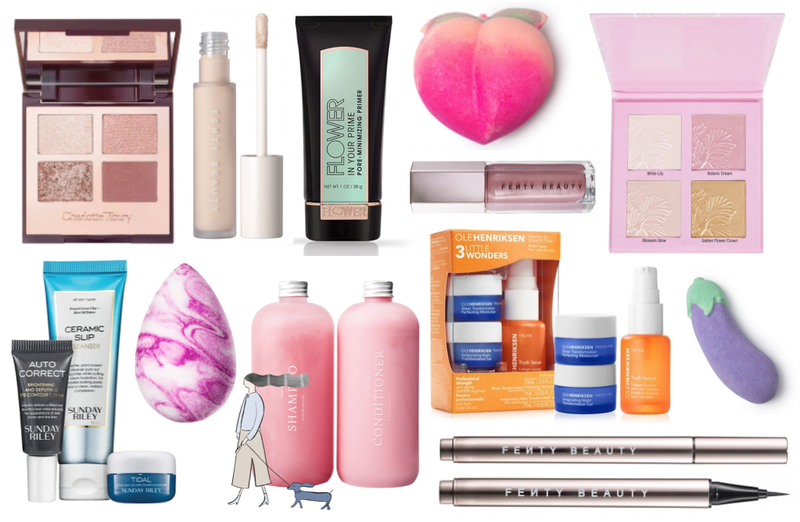 If I'm being honest, there hasn't been that many products that have really caught my attention recently when it comes to makeup but there are so many skincare products I can't wait to get my hands on! The first few items on my wishlist are makeup products, we have had quite a few exciting launches in the makeup department recently. One of the items that I am so desperate to add to my collection is the Charlotte Tilbury Rose Gold Eyeshadow Palette (£39). I know this is a palette I would use a tonne but I'm not sure if I can justify the price tag so if you've tried the Tilbury palettes, please let me know if they are worth the investment! Fenty Beauty is a brand that just needs to take all my money immediately. There are three products I really want to get next including the new concealer, the new shades of the Gloss Bomb as well as the liquid pen eyeliner. I just wish the postage cost wasn't so expensive. Wet n Wild is a brand that I have been really enjoying lately and the Highlighting Palette (£12.50) is at the top of my list. Even though I really don't need any more highlighters, I can't wait to add this to my collection. Flower Beauty just recently launched at Superdrug and as they're cruelty-free, I can't wait to get my hands on a few products soon. The primers and base products sound right up my street. The final makeup item on my wishlist is the new Beautyblender Electric Violet Swirl Sponge (£17). You can never have enough beautyblenders and I love this colour option! While I don't like how expensive Lush products have gotten recently, I love the look of the new Valentine's Day bath bombs. I think they're hilarious with the peach and eggplant bath bombs! Function of Beauty has been on my radar for a few months now and I didn't realise they shipped to the UK so fingers crossed I can test out this service soon! You can completely customise shampoo and conditioner for your hair type and even chose the colour you want your products as well as the scent. Finally on my wishlist is a lot of skincare. In the last couple of months, I have really been obsessed with skincare and finding the right acids and serums for my skin type as it begins to change with ageing. Ole Henriksen is relaunching in Boots at the beginning of next month and I honestly cannot wait. I loved the truth serum when I used it a few years ago so I'm definitely going to be investing in that again soon. I didn't realise that Sunday Riley was a cruelty-free brand and while they are completely out of my price range, Cult Beauty stocks a set for £20 where you can try out three products that I think I will have to pick up soon.